Builders create an overhang on a home for a variety of reasons. An overhang, no matter how big or small, keeps the sun and rain away from the house. It also protects a home from snow and sleet, and provides overall safety from the elements. An overhang can be built over a patio, or just over a door. Regardless of the purpose, an overhang is a great addition to any home. If you are thinking about building an overhang and you aren't sure how it's done, read through these steps. Soon you will be framing your own. Purchase the required materials. This will depend on the size of your overhang. This article focuses on framing an overhang over the front door. Apply a two-by-six wood ledger to the exterior of the home above the door, right under the roof. Nail the ledger to the studs using 16-penny nails. Attach six metal joist hangers to the ledger using construction grade wood screws. Space the joists evenly apart. 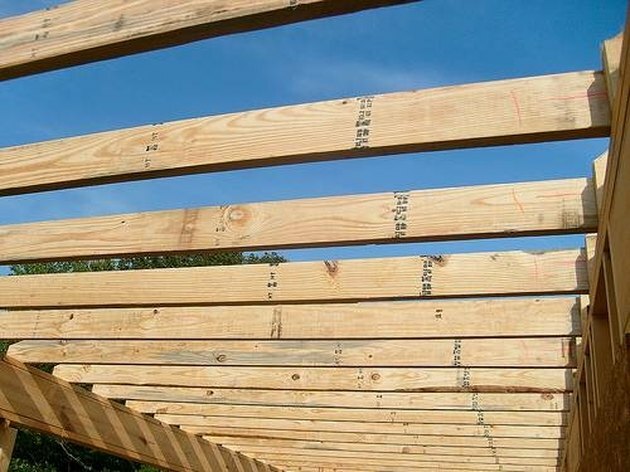 Lay a two-by-four rafter in each metal joist, securing it on each side of the joist with wood screws. The rafter can be as long or as short as you prefer. Over a door, the recommended length is 3 feet. Cut a 1/2-inch piece of plywood to fit over the top of the two-by-fours. Using a nail gun and nails, secure the plywood to the rafter studs. Attach a two-by-four to both sides of the overhang to serve as braces. Some builders will secure their overhang to posts. A shallow overhang only requires a brace on each side. Angle the braces to extend back towards the house. Nail a small wood block to the house structure and fasten your brace to the block using 16-penny nails. The blocks must be nailed to a house stud for proper strength.